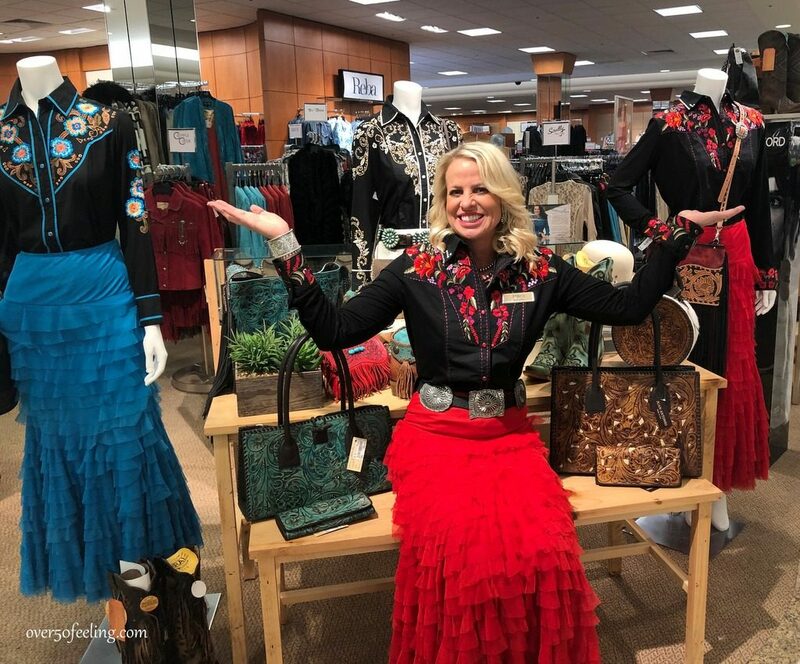 Dillard’s Texas Shop Gets Ladies Rodeo Ready! I admit this post is really for the Texas ladies, especially those in San Antonio, but I hope the rest of you might enjoy seeing how we prepare for rodeo season in Texas. 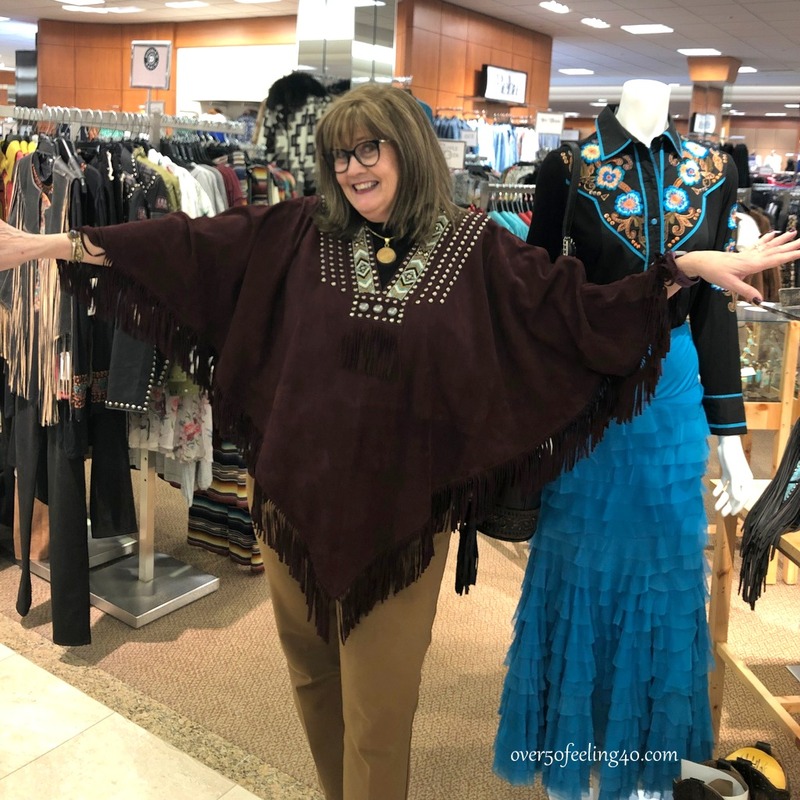 This is an introduction to the Texas shops inside of Dillard’s, I was invited to the beautiful store at the Shops of La Cantera Mall this week and it was a lesson in Texas Chic Style.. You can tell we had a great time looking at the all that is available in this special area of Dillard’s. I grew up going to rodeos…who knows how many I have attended in my lifetime, but the San Antonio Livestock Show and Rodeo is one of the best in the world. So, Texas ladies, you need to look your best as well. 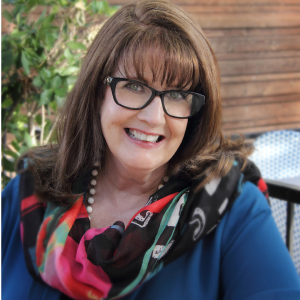 Lynda Sweet is the shopping specialist for the Texas Shop at La Cantera, and she is ready to be your stylist no matter the western occasion… a Texas wedding, rodeo, Cattle Baron’s Ball…you name it. Yes, we do wear boots and western flair occasionally to weddings in Texas. There are really two types of Texas Chic style. One is understated elegance with rich leathers, silver, crisp western blouses, and lots of turquoise jewelry. 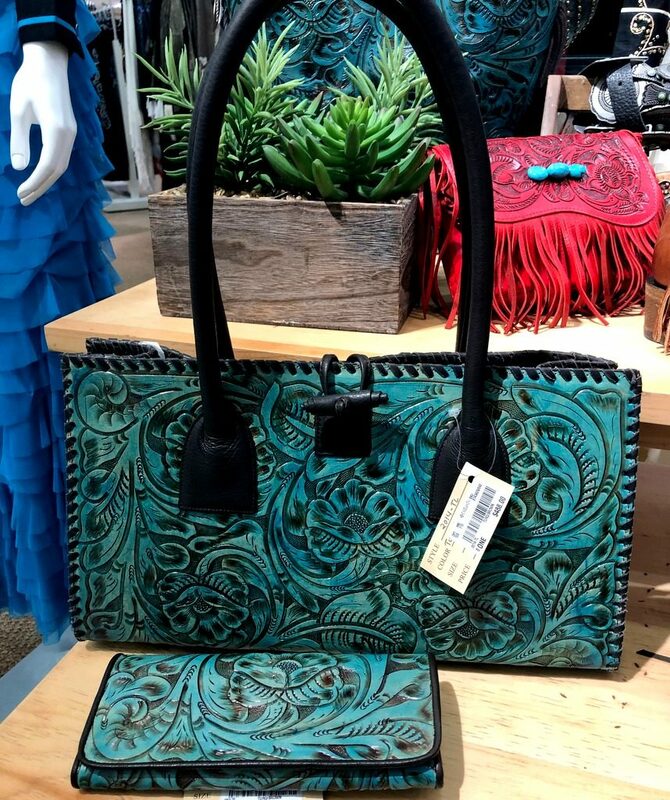 The second level of Texas Chic is all out cowgirl fun….florals, embroidery, color, kimonos, jackets, and big jewelry Both include beautiful bags, hats, and boots, of course. Lynda says the difference between the second style and bohemian style is made in the accessories. 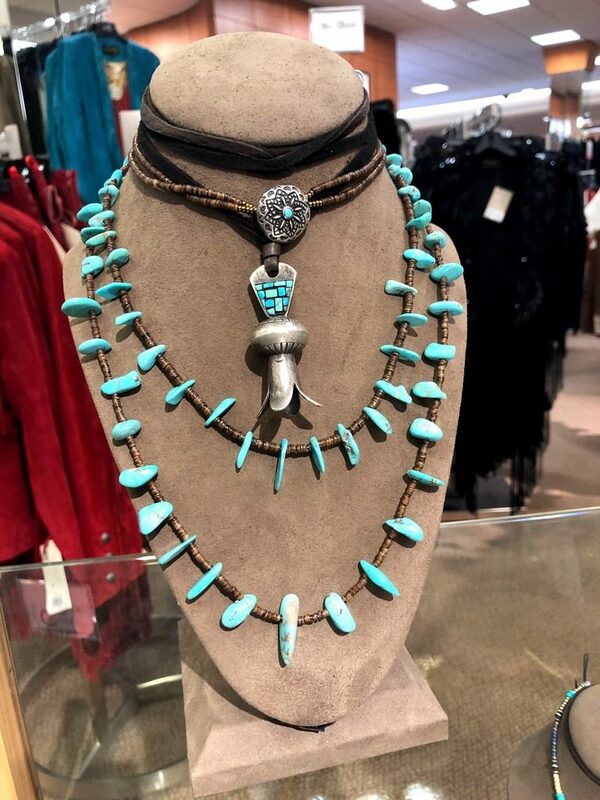 Many of the jewelry pieces from the Texas Shop are designed by native Texan Paige Wallace and they are stunning and perfect for any Texas occasion. 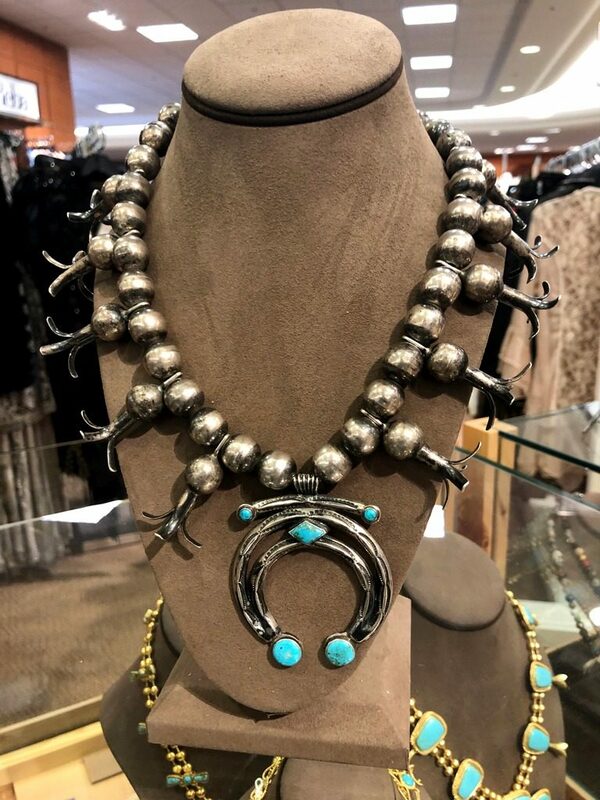 Some may think this is over the top…but for a good rodeo moment, or to make an entrance at a Texas event, these items are just perfect and Lynda is ready to help with styling assistance. You have probably figured out by now what a huge fan I am of Dillard’s.  The store atmosphere, service with a smile, and exquisite offerings are the reason they have me as a loyal customer. 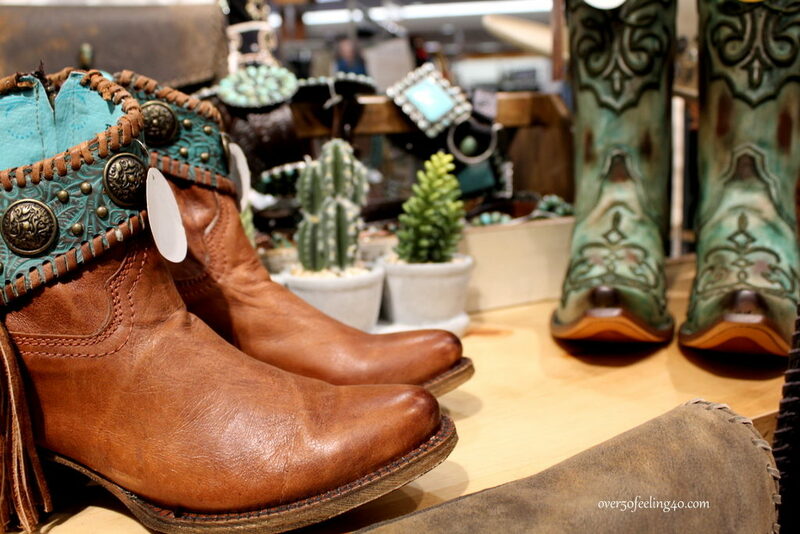 San Antonio cowgirls, head over to the location at La Cantera Mall and they will get you rodeo ready. I’m more the understated elegance style. I would wear the James Avery jewelry you have pictured. I’ve been eyeing the Santorini turquoise ear hooks for a while now. Might be time to get it.I’ve gone to the San Antonio rodeo many times having grown up south of San Antonio. With a daughter who was in 4-h, she competed in both the San Antonio rodeo and the Houston rodeo. She helped give school tours and helped on youth day. I’ve always enjoyed shopping at Dillards. I love that they now carry James Avery jewelry too. That’s a great top you are wearing in the top picture. I love everything about both looks! Although it’s not rodeo season where I live, I would still wear the red outfit even to work! The turquoise jewelry is beautiful! I really enjoyed this post! 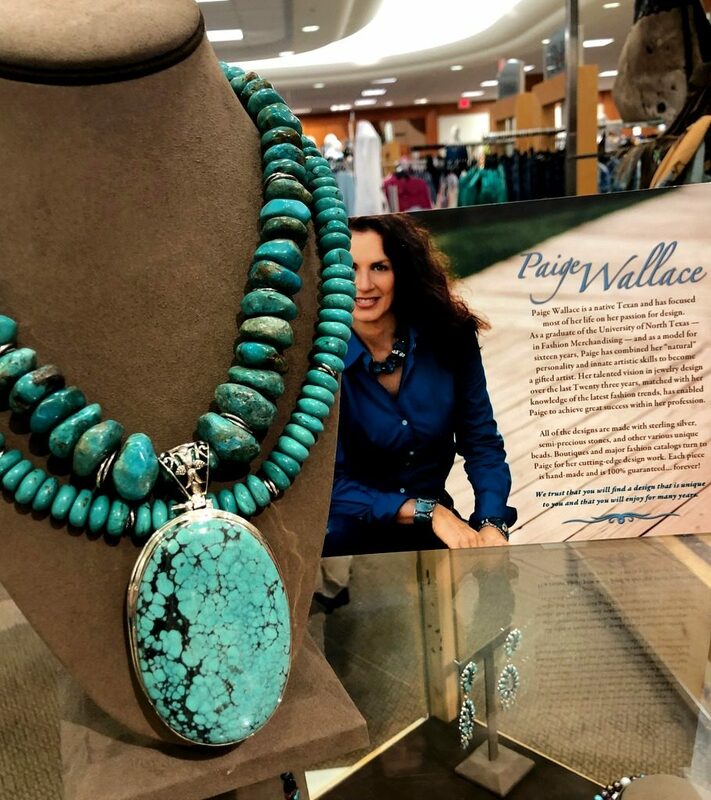 Love the jewelry…I’m an est coast girl but I did live in New Mexico for awhile and loved the rugs and tourquoise. Oh my goodness, I love it all! Especially the boots, bags, and jewelry! 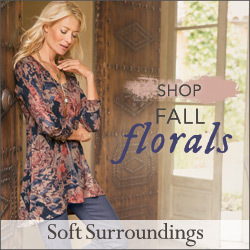 I love the blouses, but would probably wear them with jeans or a denim skirt – I don’t think the ruffly skirts would look good on me (too much belly and wide hips), but they look great on the lady in the picture. I absolutely love the handbags and the first turquoise necklace with the large pendant…in fact I’d love to buy that! I live in ND so I am familiar with rodeo fashion…around here it’s mostly just jeans, a plaid shirt and a big ol’ hat! Although that style of clothing is not me, I very much appreciate the Texan flair of color and detail. This must be a very fun time of year! I am a Dallas, TX girl and love the styles. Love the poncho you are wearing. Great post. From AZ and appreciate the beautiful jewelry, handbags and boots. What flair. Love it. I love whenever you do anything on Texas, especially San Antonio. I have a James Avery necklace with a Texas charm that I wear on my yearly visits to San Antonio. It seems to me that hair, makeup, manicures and pedicures are also important to Texas women. Am I right? ¡Qué viva Texas! Pam this is a beautiful fun post. It brought back forgotten memories of growing up in the the 50’s in Phoenix, AZ. Once a year Rodeo Days was held with a big deal parade in Scottsdale. The school children wore their “western” clothes to school for an entire week. Love this post, love the clothes, jewellery etc. etc. We lived in Western Canada for several years and did attend their rodeos. I bought a pair of cowboy boots for each of my two grandchildren – at the time aged 3 and 4 years. After they were too small we turned them into bookends by filling them with bean bags. The girls still have them. Thanks for a really interesting and colourful blog! Yes I would sure wear quite a few of the items. Hi Pam! Thank you for your very nice comments on my jewelry! I am so happy they have brought back the Texas Shops for our Texas ladies! We have another shipment of new styles coming in at the end of Feb- keep your eye out for new styles! Texas Shops are also in Houston, Austin, North Park- Dallas, Hulen- Ft Worth & Lubbock. Thanks for the good work! 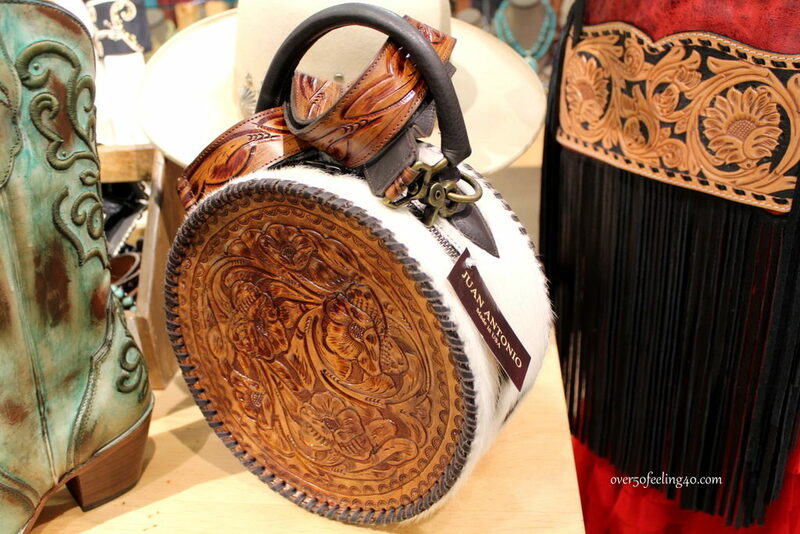 I love tooled leather purses. I have a couple that I got years ago, and when I carry them, I always get compliments.